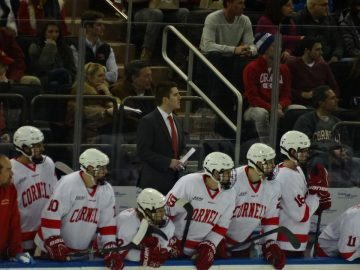 I interacted with three extraordinary people living the power of bravery at a Cornell Hockey game a few weeks ago. These short interactions had a profound impact on my perspective and compelled me to write about bravery in the world around us today. 7:00 pm – I stood next to a good friend while listening to the Cornell Pep Band play the national anthem. The air was crisp as the sound from their powerful instruments echoed throughout the old arena. My buddy’s brother is an active marine. And as the band wailed on I noticed that his chin was held high and his hand was over his heart in a salute to his brother in the military. Seeing his pride and honor for his brother got me thinking about bravery. 7:05 pm – I watched a nine-year-old kid drop the ceremonial first puck as part of a fundraiser benefitting a camp for children with cancer. He has been battling the disease since he was two years old, and his family was told on numerous occasions that he wasn’t going to survive. Several surgeries and multiple bouts with chemo later, he has still never lost his fighting and youthful spirit. As I proudly watched the little warrior walk back to the bench with the help from a couple of Cornell players, the sold-out crowd came to a roaring ovation in support for the tough little guy. Seeing his glowing smile during that moment gave me the goosebumps and got me thinking even more about bravery. 7:15 pm – I tightly wrapped a hug around the woman who manages the camp for kids and created this amazing fundraiser. This is a woman who has dedicated her life to raising funds and awareness for these incredibly resilient kids. This is also a woman whose husband just got diagnosed with the same disease she has dedicated her life to solving. And as I thought about her raising her three kids with a husband to look after as well, I couldn’t stop thinking about bravery. I have to admit that when I think about it, the first thing that comes to mind is 9/11 and the first responders who ran into burning buildings while everybody else ran away from them. I think of the young men and women in unknown, far-away places that are defending our country and way of life. These are the people that have chosen to put their bodies on the line for the safety of others. But the three interactions that I had last week got me thinking more about courageous people that are closer to home. The people that we interact with every day. The family members fighting through illnesses. The kids with special needs trying to fit in. The parents sacrificing to put food on the table…The people persevering through daily challenges that life sets in their way. Bravery comes in many different shapes, sizes, situations and circumstances. It brings out our best qualities in the most challenging of times, and is often required when we are least expecting to need it. And that is in BEING TRULY, AUTHENTICALLY and UNAPOLOGETICALLY OURSELVES. It’s striving to be the person that YOU want to be. It’s accepting that your “flaws” and differences are beautiful. It’s being totally comfortable in your own uniqueness. And it’s loving the person you are while living according to what makes you happy. That is the toughest…yet sincerest form of bravery that we all could exhibit today. We live in a time where bullying has become a national epidemic in our society. From the internet to our classrooms, bullies have stripped too many people of their individuality, creativity, and soulful spirit. When in reality, there is no such thing as a life without hardship. We all face difficult times that actually become the fabric of our character and strength. But when is the last time you posted THAT on Instagram? We live in an era where it takes bravery to stand out and be ourselves. It is courageous to believe that our happiness is in our own control, as we are surrounded by so many influences that are telling us who and what we are supposed to be. ‘Letting their parents down’. ‘Not living up to other people’s expectations’. ‘Not being loved and respected’. It was a sobering reminder that as a coach, we are dealing the PEOPLE. It was a glimpse into the soul of a group of kids that often acted macho on the outside, but on the inside craved affection and approval. They wanted so badly to fit the mold of what other people wanted them to be. When in reality, that way of thinking only stifled their development by making them fearful that they wouldn’t live up to others’ expectations. One of our most important jobs as mentors is to teach kids to be brave and give them strategies to recognize that their worth and happiness is in their own control. It is one of the hardest lessons for a kid to learn in today’s day-and-age, but vital to their health and well-being as they develop into young men and women. They need to learn to be courageous when outside influences tell them they are inferior for being different. They need to recognize that being unique is a gift, not a curse. And they need to learn to appreciate other people’s diversities as well. We can’t control the outside influences in our lives. We can’t control what other people believe about us. We can’t control what happens to our loved ones. But we can control our attitude towards the curveballs that life throws our way. Your attitude and willingness to choose to see the positive is in YOUR control. Your health and happiness will be a by-product of what you believe about yourself and your surroundings. Nobody else can take that away from you unless you let them. And today, it takes bravery and courage to truly believe that. But if you are reading this, I KNOW THAT YOU HAVE IT IN YOU TO BE BRAVE. Be Brave. Be Courageous. And be the YOU that YOU want to be.